1. Mix all ingredients together in crock pot. 2. Cook on high heat for 4-5 hours or until chicken falls apart. 3. Serve with grated cheese and tortillas or over cooked rice. The next day, Nelly couldn’t wait for her cup of coffee. She dressed quickly and headed for Celestial Visions. She could smell fresh blueberry muffins as soon she turned the corner. When she opened the door, Sadie had already poured her cup of coffee and had a saucer with two of the beautiful muffins ready at her table. Sadie grinned suddenly. “I wasn’t either when I got married. but neccessity breeds invention. I found if I could tinker with recipes instead of following directions, I was much better. And the more I practiced the better I got.” She got up suddenly and walked back to the kitchen. When she returned, she had a battered notebook in her hands. She sat down and opened the book. It was full of recipes in plastic page protectors. Flour dust swirled up as she turned the pages. “The recipes I created are all down here on these pages. As I perfected them, I wrote the recipe down so I would have the right recipes at hand. Experimenting is fun but you can’t guarantee the results.” She turned the pages until she found the one she wanted. Then she removed a paper and pencil from the back of the book. 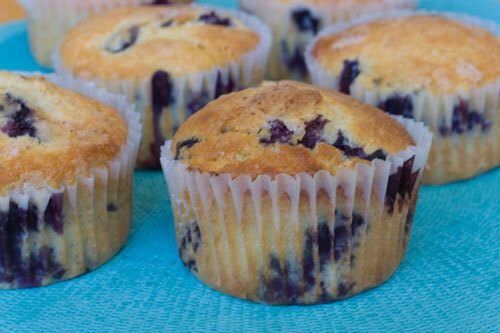 She copied the blueberry muffin recipe down onto the paper in neat, precise cursive. While she was writing, Nelly looked on in curiousity as she ate the muffins. She took her time, reveling in the bright sweet blueberry flavor. Using her index finger, she cleaned every crumb from the plate. “Okay, this is the recipe I used for the blueberry muffins you just ate. The key is to use fresh blueberries. Follow the directions precisely, and you should have muffins that taste as good as the ones you just ate.” Sadie passed the recipe to Nelly and then stood and took the book back to the kitchen. Nelly pushed her chair in and gathered her things. She waved and went out to begin her day. Nelly walked briskly down the street, wondering where to go for breakfast. It was a cold blustery November morning and a cup of strong hot coffee would be perfect about now. She turned down 19th Avenue heading toward work. She’d been down this street a million times. Suddenly, the smell of coffee and freshly baked bread wafted along the wind. She stopped and inhaled the heavenly scent and looked around. There at the end of a small brownstone building was a new sign hanging under a red and gold striped awning. Nelly quickly walked to the door. “Celestial Visions” was printed in fancy script upon the sign. She opened the door and was drawn into the sweetly scented bakery. It was a small room with the counter and one table. At the end of the room was a large stone fireplace with a cheerful fire crackling inside. There were books along one wall and the bakery case across the other. Inside the case were a half dozen plates containing bakery goods. There were doughnuts and apple fritters, several different fruit danishes, brownies, bagels and a large chocolate frosted cake adorned with chocolate chips and pecans. Behind the counter was a huge coffee urn and a doorway to the kitchen. A large woman came from the kitchen area , wiping her hands on her apron as she walked through the door. She was about the same height as Nelly with her gray hair pulled back into a bun and hairnet. She had sparkling blue eyes and a cheerful smile. Her apron had Sadie embroidered on it. Nelly smiled. “To start I would like a cup of coffee. And then I would like something to eat, but I am not sure which one I want.” She stepped back and perused the pastries. “Take your time, although I have to admit, the apple fritters are pretty delicious today.” She turned to the coffee urn and got a large blue mug from the counter. Once she had filled the mug with coffee, she got cream and sugar and set the coffee in front of Nelly. Nelly turned and sat at the table. She looked at the books on the shelf: Alice in Wonderland, Lord of the Rings, and many other fantasy classics sat on the shelf nearest to her. As she looked around she noticed tin cut stars hanging from the ceiling. They were painted different colors and then oversprayed with glitter. They swayed gently, sparkling in the sunlight that poured in through the windows. This bakery was very similar to the coffee shop she had been imagining. For as long as she could remember, she had wanted to open a small coffee shop. She envisioned a place where one could come in, sit by a fireplace and read. Customers could get free refills and pastries. She stared into the fire and daydreamed about her coffee shop. Sadie laughed. “I just love this place and like you I had imagined it for a long time before I was finally able to open it.” She also looked into the fire and sipped at her coffee. “Wow, and affordable too.” Nelly took out a ten dollar bill and handed it to Sadie. “Keep the change. The food and service were wonderful. And I will most likely see you tomorrow. I need to get to work. Thank you!” She smiled again and walked out into the street. Serve apple fritter recipe with syrup or sprinkle with powdered sugar or cinnamon sugar. Sift together the flour, sugar, salt, and baking powder. Add milk and egg; beat until batter is smooth. Fold in chopped apple. Drop by teaspoonfuls into deep hot oil — about 370° and at least 2 1/2 to 3 inches deep — and fry for about 2 to 3 minutes, until nicely browned. Drain well on paper towels then roll in confectioners’ sugar while still warm. Serve as is or warm, with syrup, if desired. So last night, we spent some time talking about health. I was feeling rather fortunate because the others I was talking to have serious health issues. So far, outside of obesity, I am relatively healthy. However, I have some genetic health problems that loom over me and being overweight will make it more likely that I will have trouble as I grow older. Soooo….I need to lose weight. I need to make this happen because for now its just sitting mostly still. The occasional stroll around the block and nightly ice cream is not the way to do it…LOL! I have a couple of close friends who are planning to have lap band surgery. This will allow them to lose weight fairly quickly. However, I am concerned about the lack of food you are able to eat after the surgery. I am considering it, mainly because up to now I have not been strong on willpower. Candy bars seem to call my name on a regular basis. What I would really like to do is figure out how to do this without surgery. From what I understand, with the surgery I would lose 100 pounds in roughly a year. That is possible with a diet and exercise as well. I lost 50 pounds after I left my ex by walking every day and cutting back on the food. My goal for the moment is 10% of my body weight. Everything I have read says that just 10% will greatly improve my chances of not getting diabetes and some of the other obesity related illnesses. So… and I am laying it on the line here, I am starting this journey at 290 lbs. My goal is 29 lbs and I would really like to lose that before I go back to work the beginning of August. If I can meet that goal then I will continue to do this on my own. If I can’t, well then I will start to look into the surgical options. Father’s Day is an interesting little holiday. On the one hand, I have my father. He and I are good for 15 minutes or so of conversation at any given time and that holds us for 6 months or so. Its not that I don’t love my dad. I do. But we really honestly have nothing to say to one another. He is a very quiet, fairly anti-social man. And I can be loud and don’t sit still any better than the kids I teach. Anyway, it makes for a relatively awkward relationship. Then there is my children’s dad. We aren’t married any longer and I suppose I still hold some resentment for the angst-ridden relationship both I and my children have with him. I wish him well and I am happy that my kids all made it by to see him today. It made him happy. But he isn’t part of my family any longer so Father’s Day doesn’t really count. Then there is my current husband. He has no children of my own. He would love to be Dad to my kids but they already have someone in that position. We have talked about adopting, in fact, we talked about it again last night. I think he could be a wonderful dad. I know he has been great for Anthony. They get along very well most of the time. I would love to give him the opportunity to see what being a father is really like. So… for me, Father’s Day has become kind of abstract. Its really very strange. I’ve come to the conclusion that I should have been born a century earlier. I have fallen in love with many of the hobbies of yesteryear. I love baking and cooking in general. I bake at least one loaf of bread or batch of rolls a week. Anthony eats brownies and jam cakes as fast as I can cook them. I am currently looking for a good recipe for danishes so I can make some for the baby shower on Sunday. Canning is my new fascination. I have canned jams and fruit such as pears and apples. We made a huge amount of applesauce last fall. I trimmed green beans for several hours and canned 60 pints or so over Christmas break. The new thing is canning meat. I have canned ground beef which makes spaghetti sauce a snap, chicken that is so tender it melts in your mouth and pork roast which I cannot wait to cook in green chili stew this fall. I am a wannabe quilter. I have collected fabric for years and completed a couple of quilts. The best one I have ever done from start to finish was the 50 state quilt my class created for the Pastabilities auction at school. I have several tops which I purchased on EBay that I would love to get quilted. I also need to finish quilts for both daughters and both grandsons. The biggest problem with quilting is that I don’t yet have a sewing room so everything has to be set up and put away each time I work on it. I would love to crochet. I buy yarn and needles periodically. I start projects but for some reason I have never been able to complete them. I don’t know if crocheting is to monotonous to keep my attention or what the deal is. I absolutely love crocheted afghans but I think I may have to leave the crocheting to those who can complete their crochet projects. Already, I make my own laundry soap. I simply cannot bring myself to buy soap when i can make my own for a fraction of the cost. The next project I am thinking about attempting is body wash and shampoos. I have the books and am doing the research. I can’t wait to try to make soap with the qualities I like in soap. I like being somewhat self-sufficient. Not sure I am ready to be off the grid completely. There are too many conveniences that I enjoy in modern society. But it sure is fun learning to do for myself! This summer has been interesting. 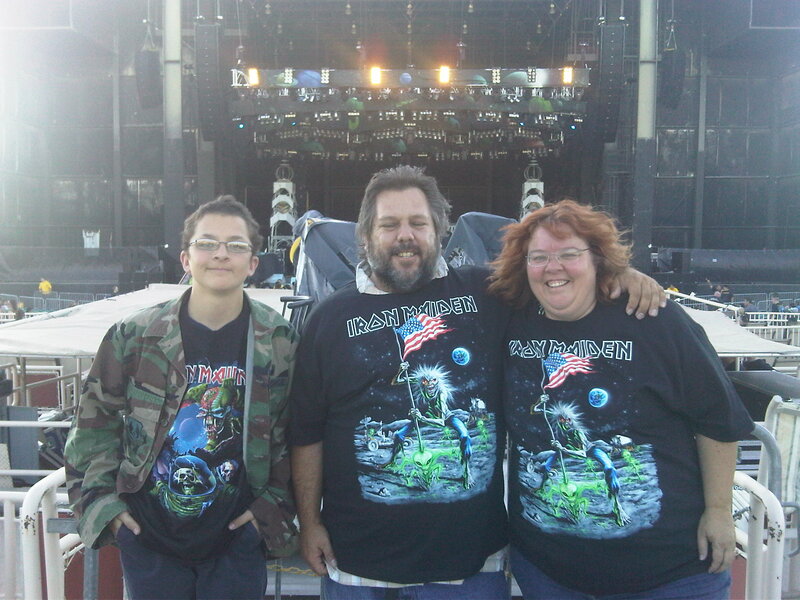 We have already been to Summerfest to see Ingram Hill and the big concert of the summer, Iron Maiden last night. We have plans to go to see Rush and a bluegrass festival later in the summer. Additionally, we may go to Zoo Music and some of the other Summerfest concerts. Its a lot of fun! I would not have chosen Iron Maiden or Rush neccisarily, but the guys really like them. 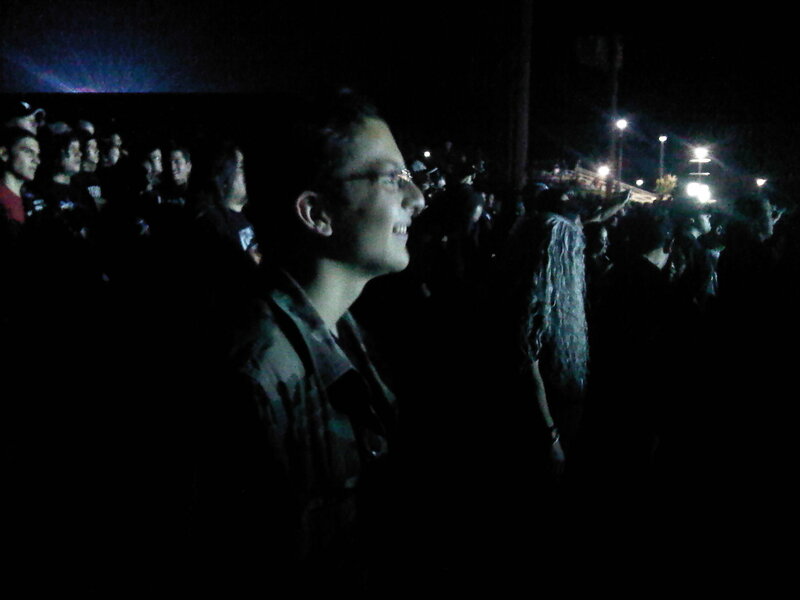 Maiden is Anthony’s favorite band and a fitting choice for his first real concert. He had a blast. All the noise and the crowds were worth enduring just to see the look on my little boy’s face:) It just doesn’t get any better than that! Music has a way of changing people. I truly believe it is an extension of one’s personality. You can learn a lot about a person by looking through their mp3. Its pretty amazing. 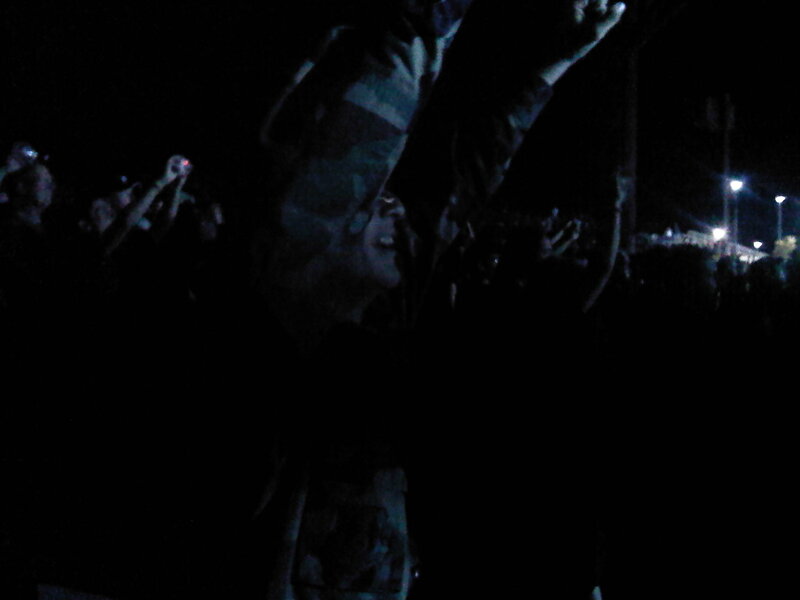 The music is bringing my family together in ways I hadn’t realized when we started this journey. And I wouldn’t change that for the world.